The character of God. Have you wondered: “What is God really like?” “Does He really love me?” Do there seem to be a lot of inconsistencies and contradictions about what even His word says about Him? Would you be interested to know that God is actually much better than He has been made out to be? This website is about our wonderful God and the revelation of what He is like through the life of His Son, Jesus. 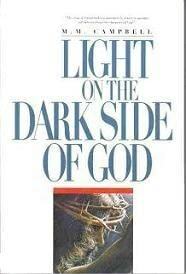 God has been badly misrepresented and misunderstood – here is an attempt to understand Him better. The Great Controversy (or Cosmic Conflict) understanding that there is a war behind the scenes leads to a much clearer picture of how we got into this mess and God’s plan for the way out. 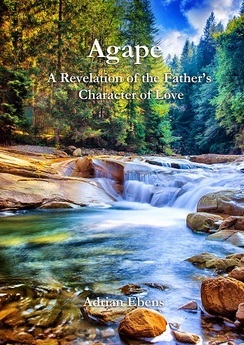 There is a wide range of views and understandings about the character of God. As a result, there is a wide range of feelings towards Him. Some love God very much and some hate Him or can’t even accept that such a being could exist. Within that range however, distinct steps can be identified; steps that correspond to major, identifiable belief systems. It seems then that how people treat their enemies would be a good measure of their character. People form their opinions of God and His character by how they perceive that He treats others, especially those that could be termed His enemies. Let’s consider the different views of God, especially how He treats His enemies, in these terms. God burns the lost in hell forever – this was a concept especially prevalent in the Dark Ages and to this time within some groups. The very idea has likely helped turn many people in to atheists. It certainly is not consistent with the concept of a loving God. God burns the lost for a short time – just long enough to get the job done. This is referred to as Annihilationism and would be favored by many in such groups as mainstream seventh-day Adventism who favor the traditional legal model of the gospel. God does not ever kill anyone with either the first or the second death. In this view, it is the consequences of sin itself that brings forth death. God saves everyone in the end including His enemies. (Universalism) One would seriously question the need to go through what this world has if that is the end result. This website takes the position that “God saves everyone” is going too far and is not supported by scripture. When God is weighed in the balance in your mind how does He rank on the good/bad scale as far as how He treats His enemies? Granted, there may be other factors that you would consider to be important in your overall assessment of the goodness of God but this would likely be a factor. Don’t feel bad about the idea of you judging Him. It is just a reference to you forming an opinion of Him and then making choices regarding your relationship with Him. Everyone does that, in fact, He invites us to do just that. There is far more involved in this than you might imagine. 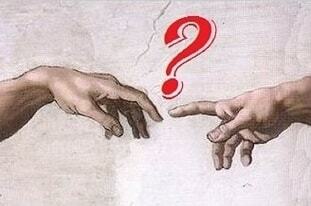 This site will explore that and seek to answer how and on what basis we should form our opinions about God. This site will examine the gospel itself within the context of a correct understanding of God’s character. We will start with the Law. Other aspects of the gospel and salvation will be added as completed. 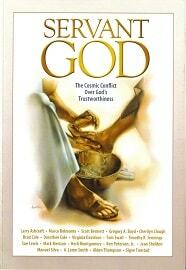 This illustrated study will help to make plain and compare two ways to understand the law of God. The lens through which we look at the law of God makes all the difference in terms of how we will understand it. 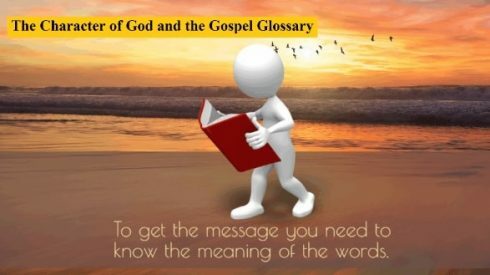 To really understand the gospel in all of its goodness including the law and its many other aspects we need to have a correct understanding of the terms the Bible uses to describe the gospel. 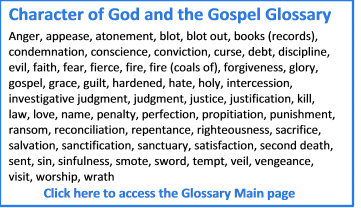 To help further that understanding, a new project for this website – The Character of God and the Gospel Glossary – has been launched. 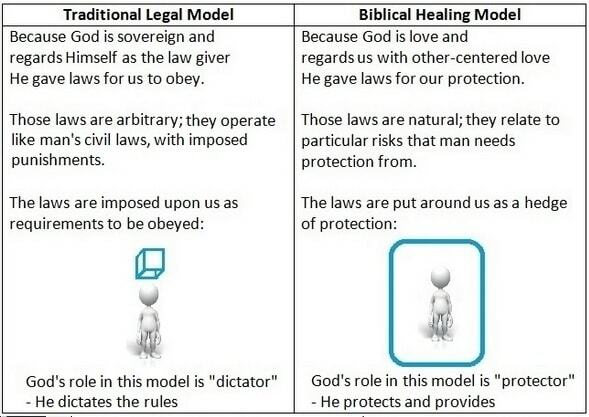 The Glossary consists of an index page with short definitions of each word, in many cases giving two definitions, one as understood according to each of two models of the gospel: “The Biblical Healing Model” and “The Traditional Legal Model.” Each word featured in the index will then link to another page giving more details about the possible meanings of the word. Material will be examined from modern and older dictionaries, commentaries and especially how the Bible itself uses and defines the words. Subscribe to this site (right column, near the top of each page) to be notified as new words are added to this important resource.